Everyone is searching for more peace, purpose and freedom in their lives and in my interview with author Cindy Henson we explore her personal journey to seeking these qualities in her life. 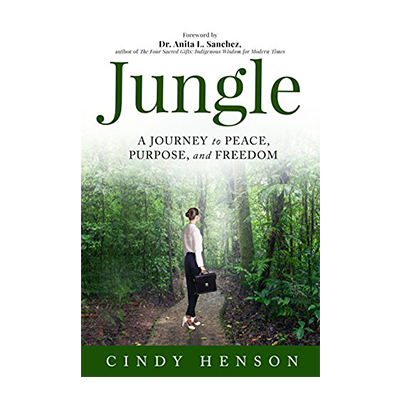 In her new book entitled ” Jungle: A Journey to Peace, Purpose and Freedom” Cindy guides the reader through a very personal story that confronts many of the issues that many of us face in obtaining a more sane and fulfilling life. There is just one twist, Cindy was driven to change her life because she spent years trying to figure out what mysterious ailments were trying to end her life. From doctor to doctor, she spent what seemed a lifetime attempting to figure what was happening to her body. Cindy’s personal story with the struggles with her health, almost dying to then finding peace by going back to school in Costa Rica at the United Nations University for Peace where she obtained her master’s degree in International Peace and Conflict Studies and Peace Education. It was a UPEACE that Cindy turned the corner and her physical strength and stamina were at an all time high. She felt the best she had felt in a long time with her daily practice of meditation and long walks in the beauty of the campus in Costa Rica. Cindy provides practical advice and questions to ponder our lives and what we really desire to be at peace, at the end of each chapter. These questions of inquiry are designed to get the reader to ponder a life of greater peace, purpose and freedom. They make us get real about our life, and find out what really makes us more content. I encourage you to listen carefully to Cindy as we discuss her new book “Jungle: A Journey to Peace, Purpose and Freedom“– and if you want to learn more about her book please click here to be directed to her website and blog.